When we were first introduced to this new condition, I thought it sounded like something from an X- Men movie. And I love X-men! And so for a split second in that doctor’s room my mind wandered into a Hollywood blockbuster and my child had super human gifts. I have a little bit more of an understanding of what Chromosome 18q- is now and have compiled a summary below of what it means in its medical sense. 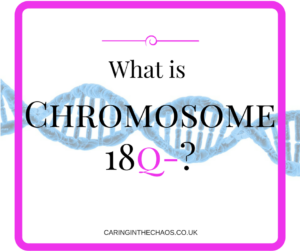 Chromosome 18q- is an abnormality affecting the 18th Chromosome. Chromosome 18Q- or Distal 18q affects the long arm of the chromosome and means there is a deletion of information on the long arm of the 18th Chromosome. When a deletion occurs on the short arm or closer to the centromere it is called Proximal deletion. Each chromosome is broken down into bands or coordinates, these bands are used to describe locations along the chromosome. These bands are divided into regions. Most distal deletions start at bands 21,22 or 23, these deletions go to the end of the chromosome. Each chromosome contains valuable content. Chromosome bands and base pairs describe the location of the genes. Genes are a necessary component for our bodies to be able to function, they deliver the information needed for our bodies to develop and grow. Each chromosome is a pair – as we get a one from Mum and one from Dad – which also means we have two copies of each gene. When a portion of a chromosome is missing it also means that portion of gene is also deleted. In some cases when a gene is deleted it may not cause any changes as there is a copy in the undeleted chromosome. However, in the cases where it does create changes, that is when we see the features of Distal 18q-, which can affect the body and development. How do you get a Chromosome abnormality? Sometimes you can inherit the condition from your parent or in some cases it can be ‘de novo’, or happening for an unknown reason. Abnormalities happen at a cellular level, usually occurring when there is an error in cell division. Both myself and my daughter’s dad was tested and we did not have an abnormality and so G’s deletion was De novo. Only 1 in 40,000 people have Chromosome 18q-, making it a rare condition. If G, decides she wants to have children she has a 50% chance of passing it on to her children. How can it affect someone with a deletion? Eye Problems are common, with Nystagmus (involuntary wobble) being reported as quite common. Regular eye checks are recommended. Ear and Sinus Infections. Especially those who have low-level IgA, which is a protein that helps fight infections. If you suspect a low-level Iga get tested as certain gene deletions increase chances of having a low IgA. Hearing problems – reports of glue ear are common, due to small ear canals and inadequate draining of fluid. This can lead to hearing loss. Regular hearing checks are recommended. Hernias – as a baby. When the stomach wall is not fully formed some organs can push through the opening causing a hernia. Hernias can correct themselves but some may require surgery. Heart defects are found in 25% to 30% of babies. Sometimes there is a hole in the heart or differences with blood vessels leading to the heart. An echocardiogram may be offered to look for any differences. Gastrointestinal Changes – Reflux is very common. This is when the contents the stomach can sometimes flow upwards, this can lead to vomiting, burning and discomfort. Foot problems are often spoken about in the community, rocker bottom feet or feet turning inwards. Growth can sometimes be affected if they have a hormone deficiency, this can be tested if your child is seen as not thriving. Hormone therapy might be introduced to help. Thyroid problems – Some signs of low thyroid include, fatigue, weight gain and depression. Thread problems can present at any time and so yearly tests of the thyroid are recommended. Delayed Myelination – Myelin is a coating on the nerve cells and helps transmit electrical information to and from the brain. Some people with 18q- have less Myelin, it is not known exactly how this affects the individual however it may impact on their development and may slow down their processing time. So it take longer to understand something or respond to a question.